I’d like to announce some great news for HTML5 game programmers, if it hasn’t been announced already. The new HTML5 game engine by Photon Storm called Phaser has been officially released! You are like a vampire or a ninja that can’t get out of the dark for more than 10 seconds. You are diving and you have for 10 seconds of oxygen. You can maybe collect air from air bubbles. You have a flash light with a 10 second battery life. Again, you might be able to collect more batteries. You have to fight against or dodge holographic opponents that don’t exist for more than 10 seconds. You can understand “seconds” as repeated portions of food. So the game would be about eating as much food as possible. I’m thinking about a game where you catch food, and have to catch the same food 10 (or 11) times in a lign. Make a game in 10 seconds. Anyway, have a great ludum dare and have fun! Good luck to all of you, and have a happy back-to-school time! Also, Mothman. I submitted Unsquare to the clay.io site for publishing. I also posted a link to html5games.com, but they usually take about a week to respond. For the 7dRTS challenge, I would have loved to team up, but unfortunately I will be absent half of the week. Maybe I will get an idea for something simple before I get back. This is my game: unsquare. Unsquare is an puzzle game made with html5 that should also work on mobile. I almost finished it, and to be fair, I would like some feedback, positive or negative, on it. Whether it’s about the difficulty, appearance, usability on mobile, or anything else, your experienced advice would be hugely appreciated. I am now at a point where I consider the game to be good, but a question floats in my mind: how good is enough? IF FOR ANY REASON YOU CAN’T PLAY, PLEASE TELL ME. Edit: Just for LOLZ: I had a problem where adblock interfered with my game since it prevented the clay.io api from being downloaded. Just a question: how to make gui s look nice and consistent? Is there any particularly tutorial that is good? I am particularly thinking about html(5) buttons and such. Also, I’m searching for how to give a game a nice and consistent look and feel. On mobile and desktop alike. Any tips or tutorials? I have been making this puzzle game and had some really good feedback on it! I see that it might actually go somewhere! I have been making a new puzzle game. Here is an early prototype. A few weeks ago, I officially published a game on Clay.io , a site specially for html5 games. Here: http://spinturret.clay.io/ .A nice thing about Clay.io, other than the useful api, is that they can host your game even before you publish it to their game collection, so you can check if everything is okay. How I messed up, is that just before publishing, I mimimized the script, and changed the generic api script for one with only the features I used. And there is where I made a mistake. Instead of doing clay.gamekey=”spinturret” , I kept the clay.gamekey=”YOURGAMEKEYHERE” . Because of that, the api didn’t work, so I couldn’t keep track of how much people played, and they couldn’t submit their scores to the leaderboard . The built-in leaderboard was I feature I really liked with clay.io, and it suited my simplistic game alot. It was supposed to be an important feature, so people would try to beat each other’s score. Anyways, Clay.io does some promoting for the newest games, features them in their newsmail and stuff. If my game would have not been broken, I would have probably had some users interested for longer. Moral: always wait 24 hours after your last change (be it minimizing) before publishing your game. If you want absolutely someone to play it, you could go ask your Facebook friends, or maybe not. Then, to my next point: my promotional image. It seems pretty amateur, right? It’s just a screenshot. Much better, right, much more professional. If I had this image when I had released the game, I would have probably gotten more players.This time, it’s not a screenshot, but an image entirely recreated in Gimp and Inkscape. Moral: screenshots and promotion art are really important, since it would influence how much people would get to your game in the first place. So you should have them nice and beautiful when you publish a game. Anyway, in shameless self promotion I declare: go play my game at http://spinturret.clay.io/ ! I didn’t do the latest Dare, I had exams. But still, I have a few things to say. First of all, for y’all doing HTML5 games, Clay.io is awesome! Not only do they host your game, but also give you an API for adding Advertisements, Leaderboards, in-game purchase and whatnot! Second of all, I reworked a bit SpinTurret, a game that I made for a Mini-Ludum dare, that weirdly resembles the current theme! It is a simple 2key game, the first of mine that I could call finished. I have also adjusted it to work on mobile. I didn’t finish polishing it yet, but here it is: spinturret.clay.io . Messing with compasses is fun. I will probably listen to SuicideSheeep on Youtube (great chill-out music). I hope that this time the theme would be something highly spiritual, esoterical, metaphysical, or occult. The more interpretations, the better. 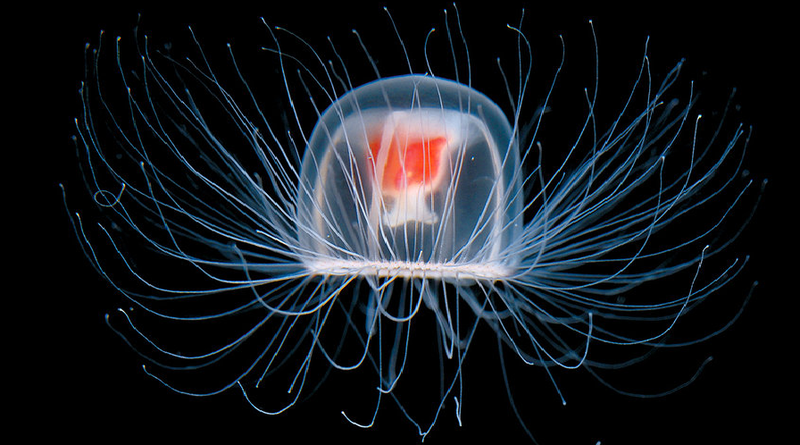 Also, I propose that this time’s mascot would be a jellyfish, and particularly the Turritopsis nutricula, the Immortal Jellyfish that can reverse its ageing process and possibly obtain immortality. Programming hobby = Math skills? On a seperate note, I had a busy week, giving in my IB personal project and going to the Montreal Science Fair. But now it’s over, and I will spend more time on my projects. For instance, I want to advance a web drawing program/game that I was making. I am also going to participate in the next Ludum Dare. P.S. How do you change your profile picture? I want people to recognize me! hint : you can draw on that thing. Now, at the stage I am with my project, I’m doing the frontend UI, and html buttons, css, jquery and stuff would be really helpful, yet I am still noob at it. I’m going to concentrate on the parts that I know I’ll do well, and then, maybe I’ll collaborate with somebody. Guess what I am up to! I’ll just leave this link here. 😉 It is an early pre-pre-pre-prototype. I got the main interface to a working state (try scrolling) today. My first multiplayer online demo! So I started making an online multiplayer thingy. How hard can it be? I asked myself. Well… PRETTY HARD! Making a game on a single computer has became pretty straightforward to me, but making a game on multiple computers is much more complicated, since I had to synchronize the characters, and make sure to remove and add characters when they connected or disconnected. I used js for both client and server (node.js) and used sockets.io to do the realtime communication. My code is certainly a huge mess! I had a chunk of code for the client, a chunk of code for the server, and a chunk of code that both had access to, not speaking about libraries. Anyways, it’s a beginning, and I’d like to see some of you made try it, to make sure the port forwarding and everything is correct. The link will be valid until I will shutdown the computer or my IP adress changes. 28 queries executed in 0.113 seconds.